English roast beef is a dish of Anglo-Saxon origin that is cooked on flame or in the oven. 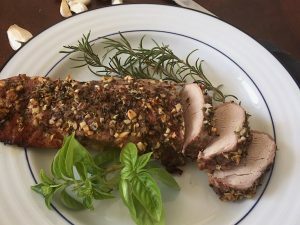 The piece of meat used for this recipe is the loin, a cut of fine meat, quite lean and very tender, tasty and succulent. 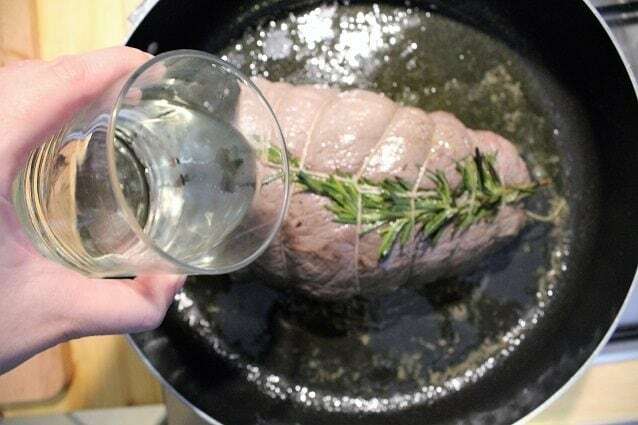 Making roast beef is really simple, you just have to sear it in the frying pan on all sides, so that the meat retains all its liquids, and finish cooking it in the oven. 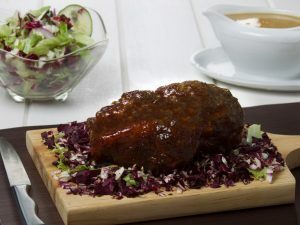 According to the original recipe, the English roast beef is seasoned with mustard and served in thin slices, and then accompanied with different sauces (for example, aromatic herbs sauce or a sweet and sour sauce of red fruits). The traditional process involves the flouring of the meat and the addition of salt, pepper and mustard powder, but I made a small change, omitting this step, because I salted and peppered the meat only halfway through cooking and then I brushed the meat with mustard cream. In this way I avoided that the meat dried out during cooking, and I simplified the recipe a bit. 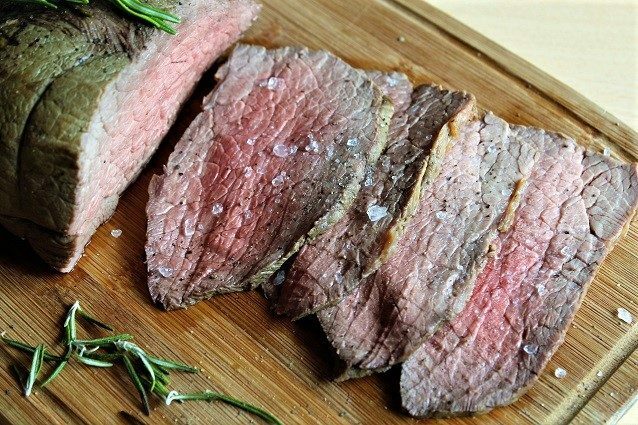 I must say that this cut of meat is so good and tender that you can also add just a pinch of salt, the result would still be excellent! 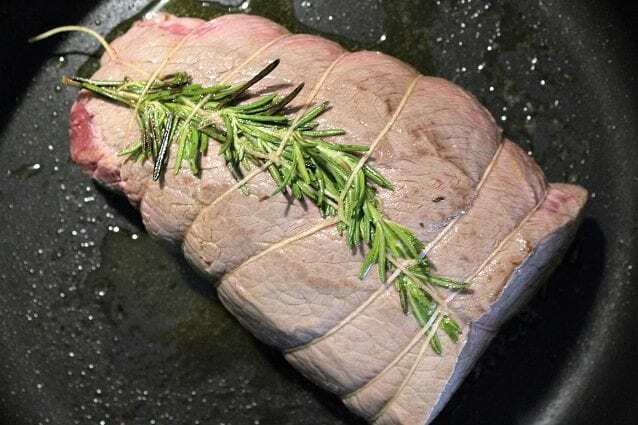 Place the piece of beef on the cutting board with a sprig of rosemary on it, wrap it with some twine, passing it at the end and forming a noose. Then tie the twine along the whole piece of meat until you reach the other end and then make a series of turns parallel to the first. Then, place the meat in the pan in which you have poured the oil, and let it brown on all sides to seal the juices inside. Sprinkle with half a glass of white wine and let it evaporate for about 5 minutes. 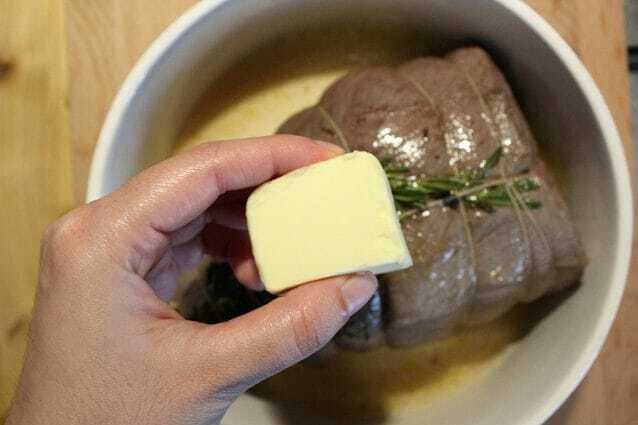 Place the meat in a baking tray with the cooking base, and then add the butter. Bake at 220 degrees for 10 minutes. 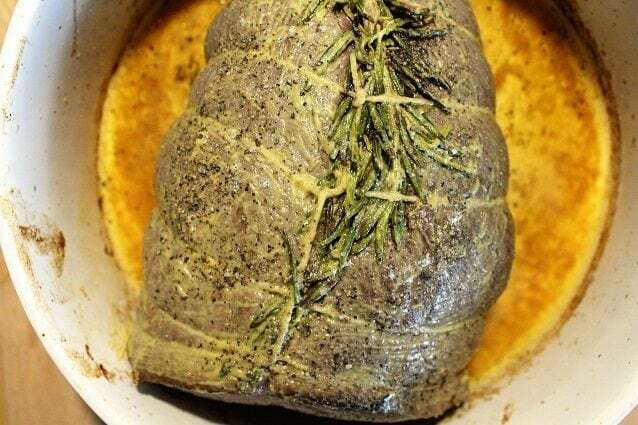 Then remove the baking tray and brush the roast beef with mustard on all sides. Add salt and pepper and bake in the oven for other 20 minutes, turning it from time to time and taking care to cover it with its own juices. and let it rest for 10/15 minutes to allow the meat to absorb all the juices and to soften. 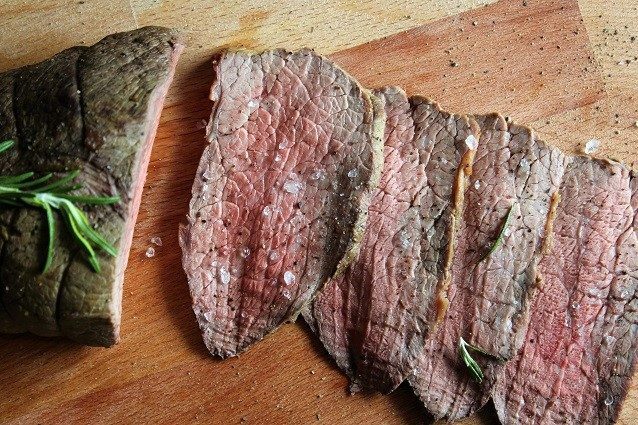 At this point, your English roast beef will be ready to be cut into thin slices. You can serve it hot with the cooking base, or cold. 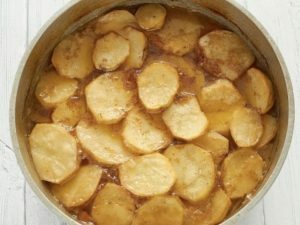 The ideal side dish for the English roast beef is roasted potatoes: peel 6 medium potatoes, cut them into small pieces and add them to the pan where you cook the meat, with a bit of salt and rosemary. To control the cooking of the meat, depending on whether you want it well done, medium or rare, you can use a specific meat thermometer: at 40 degrees the meat will be rare, at 48-55 degrees it will be medium, and from 58 degrees onwards it will be well done. Consider at least 20 minutes of cooking for every kilogram of meat. 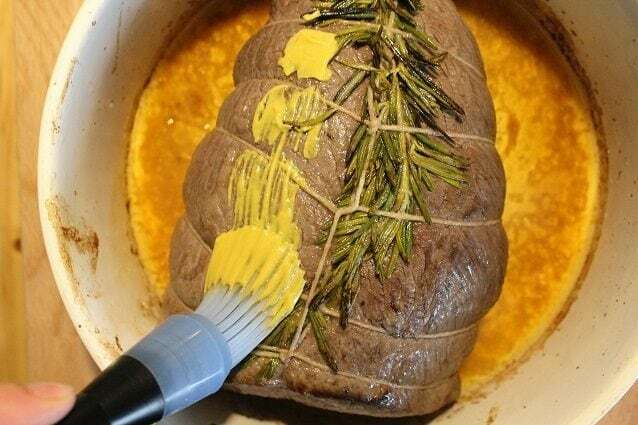 The meat must absolutely rest at least 10 minutes wrapped in aluminum film, so cut it just after resting it, otherwise it will release all its juices. 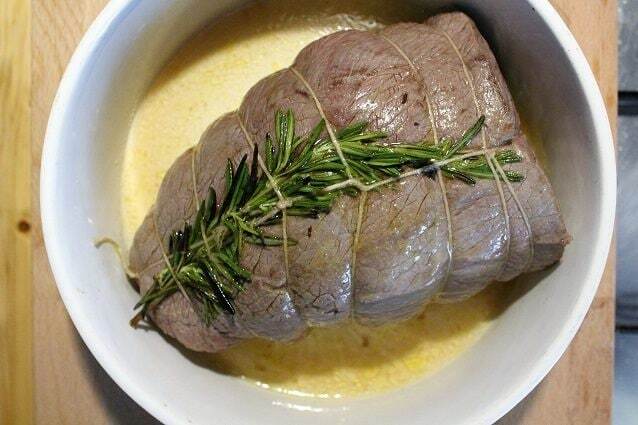 You can also make it rest in the oven, always wrapped in aluminum film. 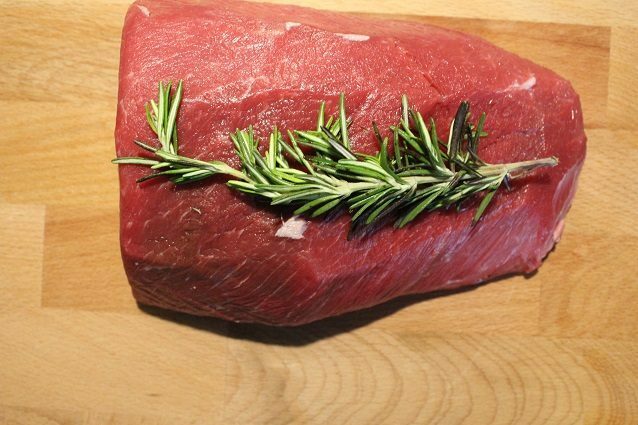 Avoid cuts that are too thin like fillet. In addition to mustard, you can also add 1 tablespoon of Worcestershire sauce. You can also cook the roast beef in a frying pan, as long as it has high edges and you cover it with a lid for 20 minutes. If you have a meat slicer you will certainly get a perfect cut, otherwise use a knife with a sharp blade. 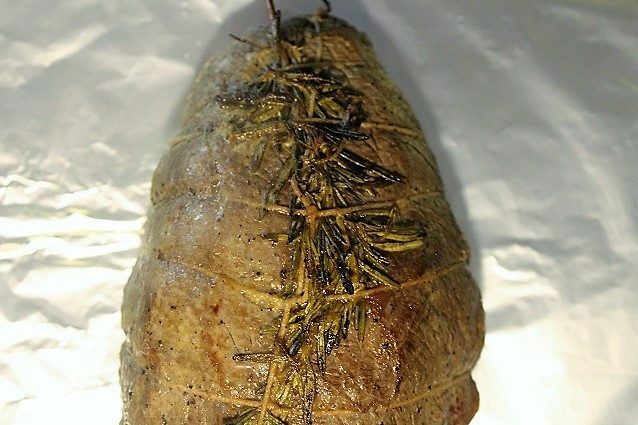 Once sliced, English Roast beef can be preserved in a refrigerator in an airtight container for 2-3 days.